That is the best excuse I can muster for our twelfth place on handicap today on a day when the breeze direction was favorable. I had considered going up one genoa size for the lighter conditions today but when the breeze freshened pre start the crew agreed the old faithful off Passion would be adequate for the day. We made a very good start on the line with speed but were squeeze out by Hitchhike coming up from Leeward and Allegro reaching down across our bow. Now we are getting to the pointy end of the season and a bit of dirty air is to be expected but I felt uncomfortable in such close quarters and dropped behind Allegro as soon as I could to take a higher course . To my surprise Joli was already in front of the fleet and close enough for Passion X to be in her wind shadow. With Allegro and Hitchhike below there was not a lot of room to run away for clear air. We made small gains and had almost broken through for clear air when Amante and Allegro now behind, came up with fresh breeze and forced Joli to go higher. We held our line to the mark and were rewarded with a clear ahead position behind Hitchhike at the top mark. Hitchhike did the safe thing and put in a short dig to the shore so that she was not tacking back into the starboard tack fleet and we did the same to a lesser extent so that they were just ahead and to windward on the way back. 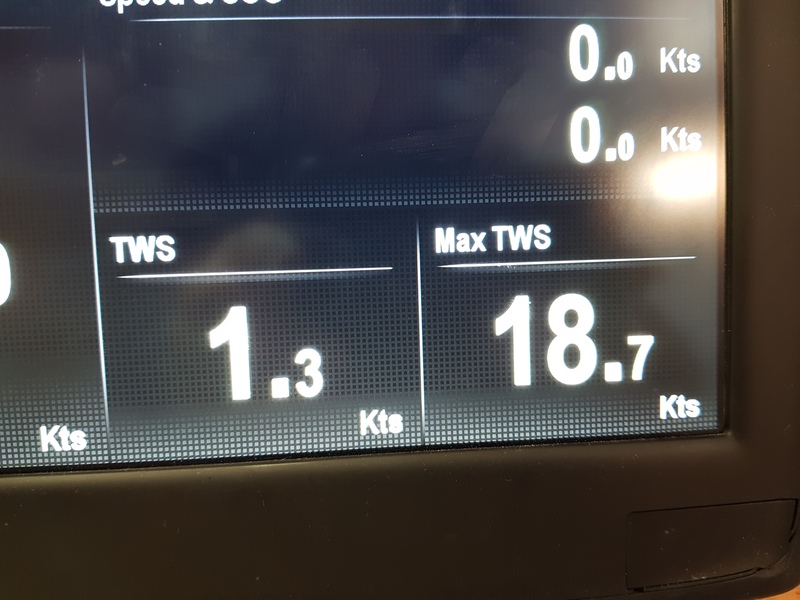 With the 40 m2 genoa and flattened main we held our position quite well to Steele Point and were pleased with our windward speed and height. Once past the point Joli was the first to tack away into Rose Bay and was rewarded with a big lift and a huge gain on Hitchhike and Passion X. We were the most leeward and ahead yacht and soon had the fleet lifting well above us. Allegro powered ahead in the strong breeze until forced away by The Red Hand charging through the fleet. 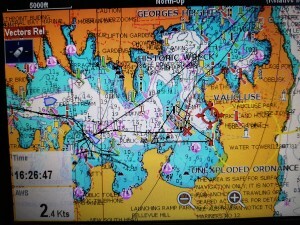 We had almost reached the island when the lift reached us and that meant tacking away from the lift. Without The Red Hand in the way we might have been able to lift further along the shore of the island but we had the hand we were dealt and carried the knock all the way into Rose Bay only to tack for the mark and be knocked again. 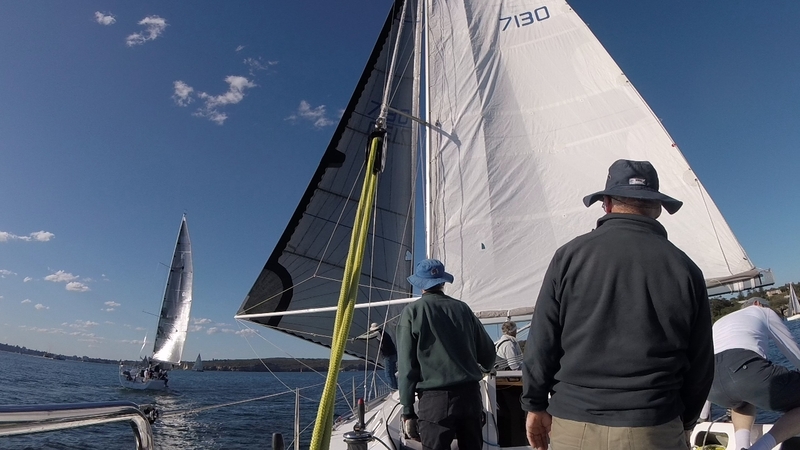 There is no doubt that the out of phase sailing cost us a couple of minutes as we went from a better than usual position at Steele Point to a pretty average one in Rose Bay. The tracks from last week were still on the plotter and the difference in similar wind strength and direction is very telling. 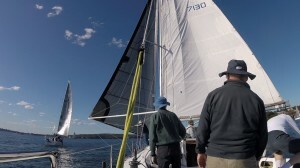 In this phase Hanni and Amante drew well away and Amante went on to take line honours while we were two minutes adrift. Joli who had been first to tack for the new lifting breeze deserved a better result but the Hanni and Amanti group got the lifts coming and going and I would like to see their tracks for the day. It was a bit of a procession around the island and back to the finish and while we made up some ground on the reach the breeze was now fading and our chance of big gains on the reach limited. There were a lot of good points for the day. We did beat Hitchhike and Hanni and Meridian on handicap. Our positions at the back of the handicap fleet reflects both the punishment from the handicapper and that the following yachts had a better angle into Rose Bay. Joli, Hithchike and Passion X who had been on the podium will suffer from today’s results and Trim, Izzi and Agrovation who were not far behind will be celebrating their gains. The new chartplotter looks safe in the new enclosure, the cleat along the centre line of the cockpit floor was well received by the crew and the new numbers on the cabin side for the genoa car position look very professional. We has a safe day with plenty of close racing and plenty of action. 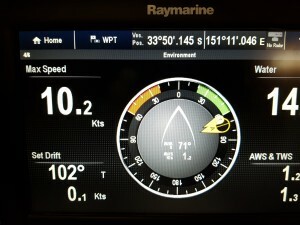 Boat speed was down from 10.6 knots last week. 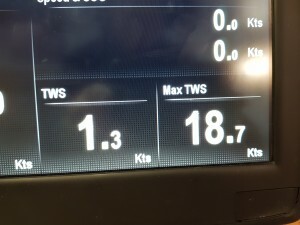 Maximum wind speed was 5 knots lower than last week. The genoa car numbers look the part. I have a list of small jobs to do on Passion X to complete some original task, to add crew requests and a small amount of routine maintenance. 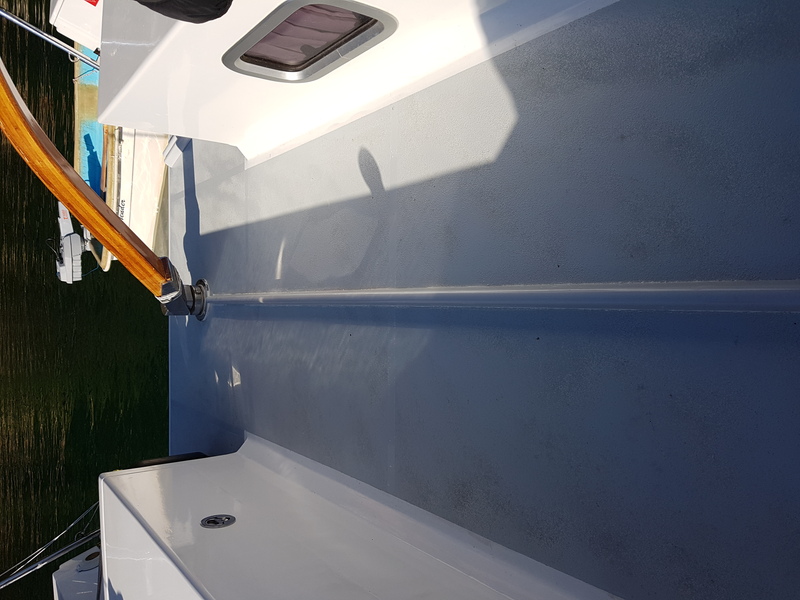 The sticky back cable tie mounts on the bilge pump lines proved inadequate for the task so a small maintenance task was to replace these with some solid screw mounted ties and while the tiniest or jobs it is satisfying to have the pipe runs now very secure. On the unfinished tasks list was installing the gland packing in the rudder stock housing. 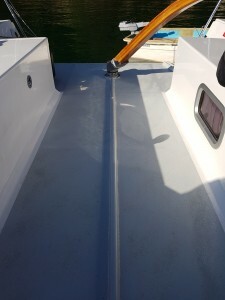 Now the gland is well above the water line and the high lube Vesconite bearing has minimal clearance so a negligible amount of sea water makes its way into the boat. Indeed there is still some dry sawdust on the floor but for the sake of good order I have installed the gland packing and secured the keeper with four stainless steel bolts nipped up just finger tight. The crew has been very demanding of late and as if two spinnaker poles were not enough they wanted extra foot holds on the cockpit floor. I have been very pleased with my 850 mm wide cockpit but as Passion X heels a lot a central floor cleat for a foot hold seemed like a reasonable request. 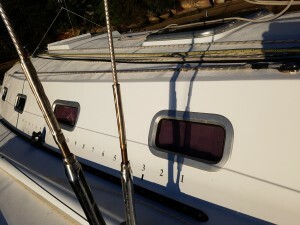 Today with Elaine’s help I installed the cleat and we will see if the effort was worthwhile. A cleat for a foot hold on the cockpit floor. 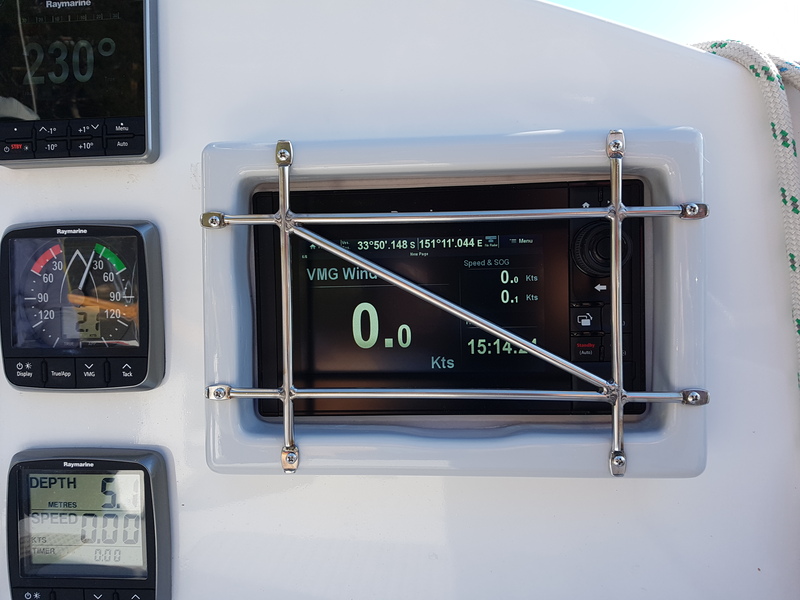 After a long wait the replacement chartplotter is installed and protective cage completed. The cage had solid stainless steel rod across the face to protect the screen from the crew. 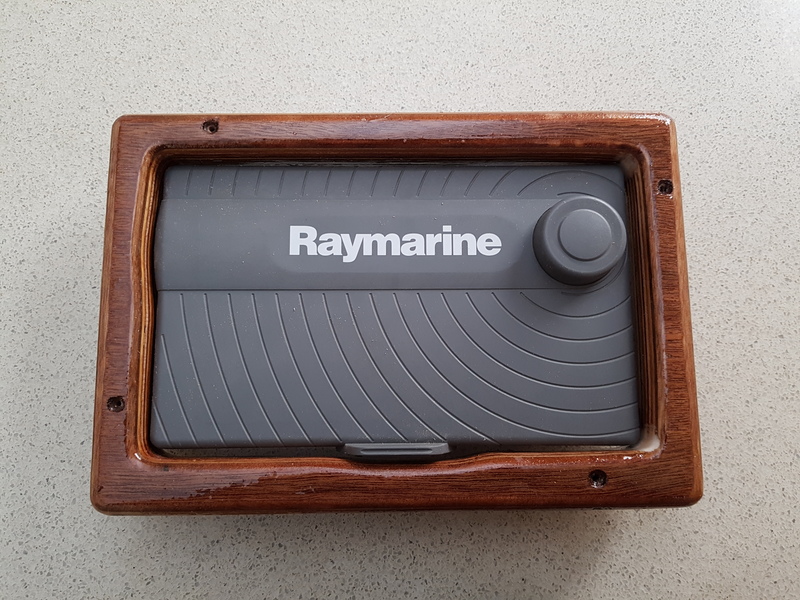 A protective cage for the chartplotter. It is removable so that the sun cover can be replaced after each outing. I am more than half way through changing the dome nuts on the chainplates for nylock nuts. At launch last March the rigger said he would prefer nylock nuts as there is a chance that the dome nuts will pull up in the bolt instead of the flange. Now nothing has moved in the 18 months since launch but for the sake of peace of mind I am changing out the nuts and concede that some of the dome nuts were pulling up on the bolt instead of the chainplate. The list is longer as I have still to install a small amount of furniture trim and do the final painting of the galley tops and chart table. Perhaps these will get done before Christmas. Our handicap has been getting tougher of late and today in perfect conditions for Passion X we were relegated back to 11th place and have fallen off the podium in the overall point score. On the course we enjoyed the conditions immensely with a fresh reach to the heads and a single board back to Steele Point. 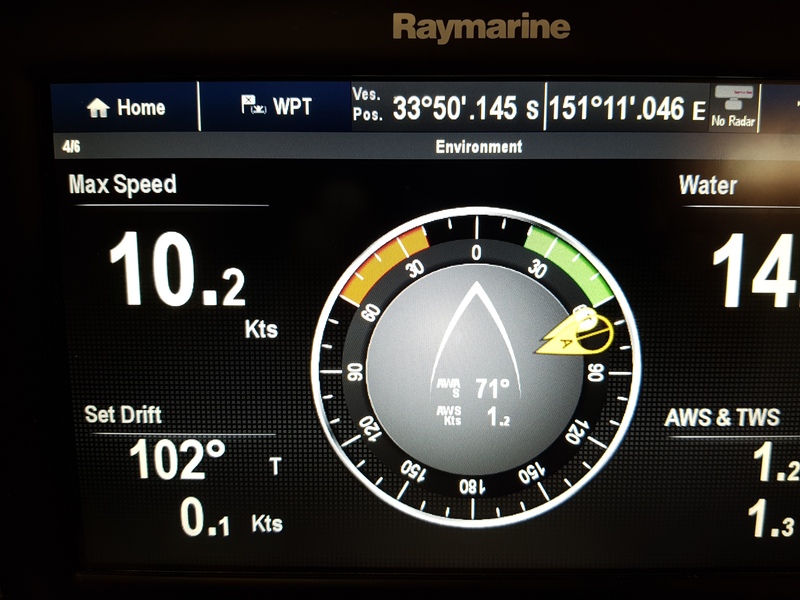 For the reach down we saw 23 knots wind speed at one stage and hit 10.9 knots of boat speed. Only the reaching demon Fidelis and the well sailed Hitchhike beat us to the heads. I was worried about tacking back into the fleet as the fleet was broad reaching on starboard to the mark and we would be tacking back into them on port so I did a short dig into the shore which was our undoing. Hanni just behind hard tacked on the mark and then worked up under us driving us further and higher into the shore line. As the boat speeds were very similar we could not pull away under her stern and ended up high and in the rubbish breeze coming over the hill. Amante coming up from behind was able to keep wide and steady and pull through to leeward of both of us. We had the carbon genoa off the old Passion up for the day and with the breeze gusting up to 20 frequently we had the mainsail flogging in the slipstream off the genoa. This was quite comfortable and we were making up some ground on Hitchhike which was pleasing On the only real work of the day Hanni caught Hitchhike and gave her the same treatment she had given Passion X earlier on the leg and driving her above the layline to the Rose Bay mark. 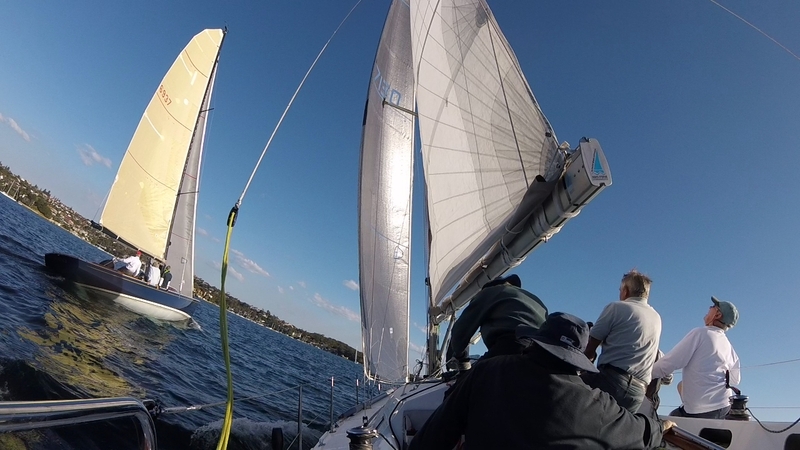 Meanwhile Allegro had come charging up on the work and had a clear overlap on Passion X at the Rose Bay mark. Despite the next two legs being free ones we could not overtake Allegro and sat in her dirty air for quite a while. Once around the island we went high for clearance and were able to pull over the top of Allegro to beat her across the line. On handicap however Allegro did Passion X by just 2 seconds. Close behind Allegro was Trim looking very threatening and it was no surprise that Trim took second on handicap from Izzi with Fidelis third. Izzi is a very good Northshore 38 and likes the reaching conditions too. Now I had not been paying attention and did not realize that the handicap on Fidelis had shrunk so much but with first and third in the last two races the handicapper will be having a hard look at that. Hanni in seventh place was just 32 seconds clear of Passion in 11th place so it is all good racing and places are there for the taking. Now we are off the podium by 2 seconds. Yes that is the time Allegro beat us by today and had we not dropped that one place we would still be third. Joli is half a point ahead and will be hoping for a return to the long windward beats to get back to the front of the fleet. 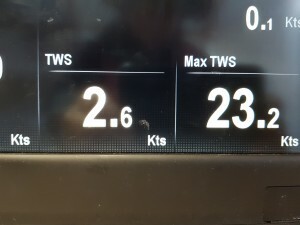 23.2 knots true wind speed at the peak. The officials at RANSA abandoned today’s race due to persistent gusts over 30 knots but as we were there and ready to go we had a training session. The No3 jib and one reef in the main was a good choice for the solo sail to the heads during which time we hit a modest 10.6 knots. 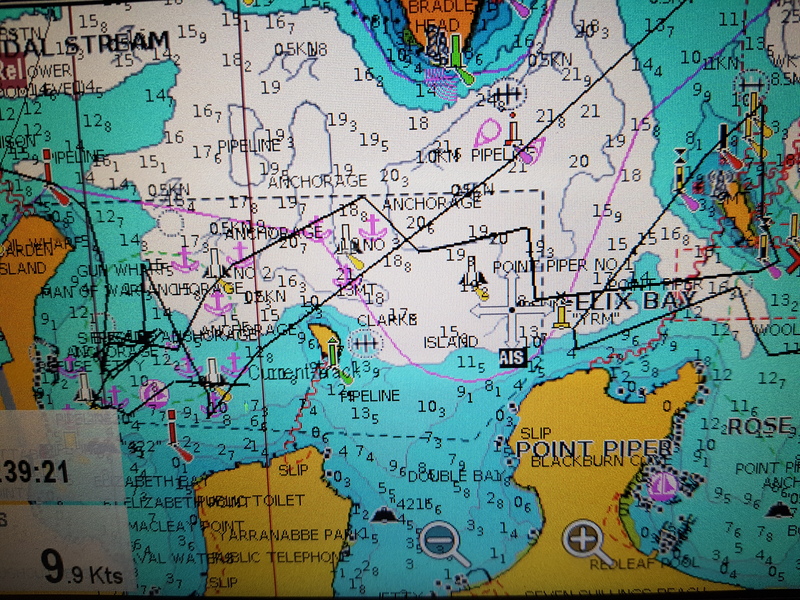 For the broad reach I feel we could have easily carried the full main but on the beat back to Steele point the reefed main was hanging out flogging in the wind. We sailed the short course and went around the Point Piper mark before beating back to what is usually the finish line. For practice I put in the second reef and was pleased with that because a 34.6 knot gust hit and put us on our ear even with the double reef. 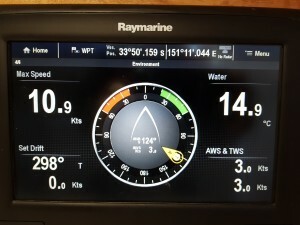 The round trip took very close to 60 minutes but as we had started just after 1:30 pm it was an early finish to what was a very tidy solo sail. I did play around with a phone app for the afternoon and it recorded our speed and direction. Our result from Wednesday was not helped by the selection of the no 1,5 genoa where we gave away 5 m2 of sail area which would have been very useful in the light conditions. The larger genoa also fits around the shrouds better and has a marginally fuller entry which again would have been useful. Our result towards the back of the fleet was a discard but that did not stop the handicapper applying a small adjustment so that now we have to give Allegro a few seconds. Hanni also had a small adjustment so that now she has to give both Passion and Allegro a few seconds and judging by how well Hanni went to windward last Wednesday we will need all of that allowance and some. Joli did not get much back from her handicap place next to us but if she can sail like Meridian she will be OK.
Now that we have taken the adjustable pole off Passion X we need a short one for poling out the small headsails and for poling the large genoas out to leeward on the broad reaches. 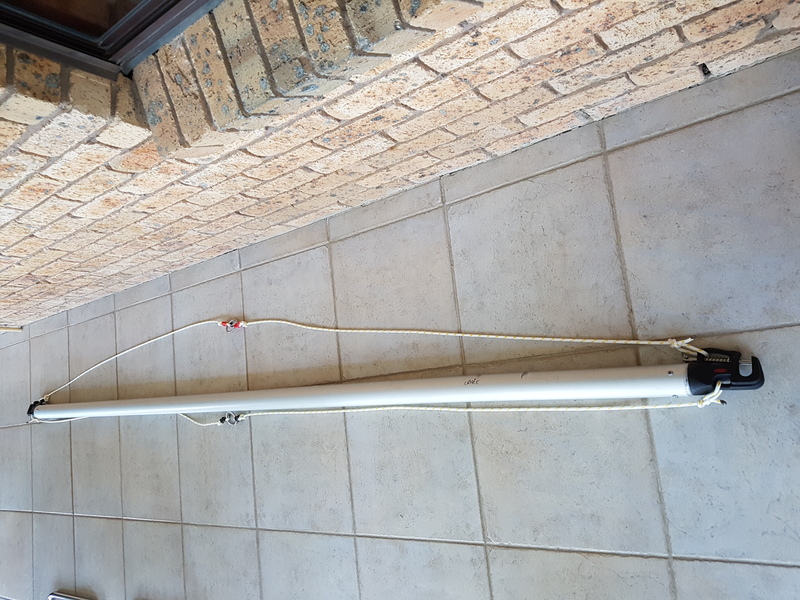 An old Laser full rig bottom section was ideal for the job and today I finished the 3 metre short pole ready for next week. I am still progressing a frame to protect the chart plotter on the bulkhead as we have put a knee through the screen and need to replace the unit. I replacement chart plotter is on order but it will not be installed until I am happy that the new frame will protect it adequately. The short pole made from a Laser full rig bottom section is ready to use. I am sure this is the feeling of many of the yachties who contested the RANSA Winter Series today as many had the opportunity to be in front of the fleet only to find their handicap position was at the bottom of the list. The first to fall from grace was Larrikin who made a very good start on the pin end of the line in the only breeze on the course. 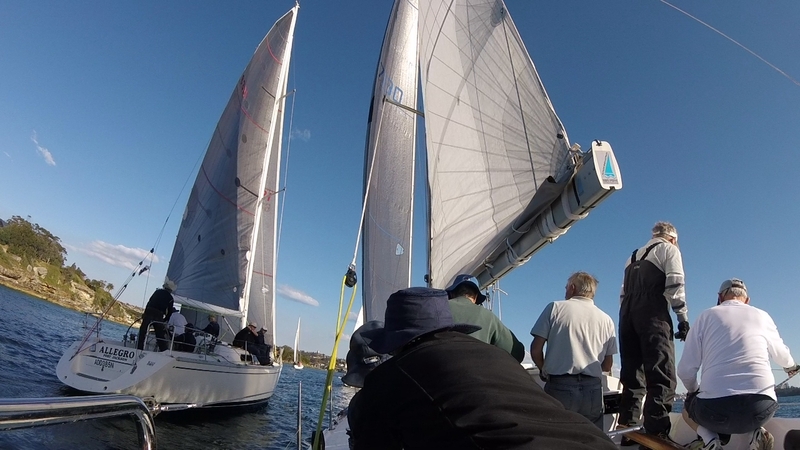 Larrikin shot to the lead and very wisely ran down with the breeze to cross our bow. We had managed to point up from below Trim and Allegro to have a handy lead on that pair and when Larrikin sailed across our bow into nothing we momentarily led the fleet. Below Joli picked up her private streak of breeze and shot to the lead only to sail into another light patch. For a few minutes it looked like we would catch the No1s fleet yacht, Duende, but a little Nor easter came down the harbout just to Duende and no further so we were left in the no man’s land between the breezes. Eventually the westerly breeze won out and brought the tail enders up to the lead. Senta and Mako must have thought all their Christmases had come at once as they reached up the course and went on to first and second on handicap by three minute margins from Trim. Trim was having a good day both downwind and upwind and deserved her third position on handicap. At the top mark Joli lead Allegro and Trim while we were in the dirty air behind. I wanted to keep going left for the persistent shift and to get out of the tide and the two times we tacked away because of dirty air cost us much more than if we had hung on. First it was Allegro whose dirty air we were not enjoying and the second time it was Hanni. On both occasions we lost a minute by being on the wrong side of the next shift. At this stage little Britannia joined us courtesy of better shift picking and only our longer water line and larger sail area allowed us to climb over the top on the way into Rose Bay. 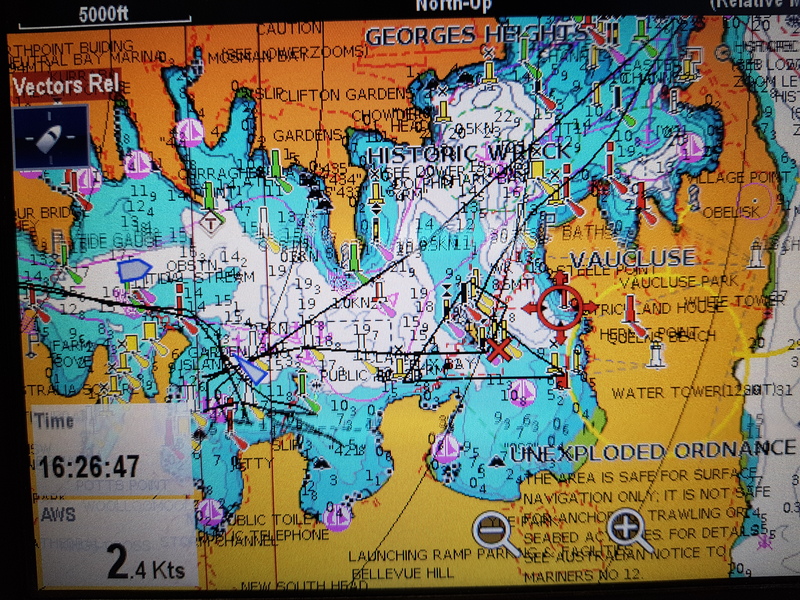 The leg into Rose Bay was one of our better ones as the breeze freed up so we were just off a hard beat and were able to build up a bit of speed. On the windward work the J 121 twins, Joli and Meridian, pulled well ahead with Meridian fastest from Hanni and Joli but that was not good enough to save Joli who joined Passion X and Allegro at the back of the handicap list along with Larrikin and Krakatoa. While we beat Allegro in handicap on the day we both scored discards and as Allegro’s next was half a point better than Passion X’s we slipped back to fourth overall. Joli kept her tenth place and retains second overall while Hitchhike who never showed up stays on top. On the last work to the finish it paid to be a little high and on this leg we almost caught Allegro who by now must have been wondering if they could do anything right.